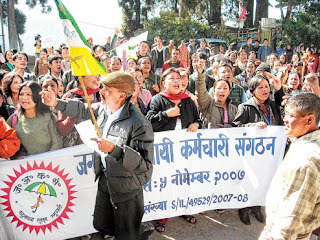 The Janmukti Asthayi Karmachari Sangathan (JAKS) has expressed satisfaction with the decision of the Gorkhaland Territorial Administration to regularise casual workers and expressed hope that the state government too would extend its cooperation. On February 2, the GTA Sabha passed a resolution giving the state government a month’s ultimatum toregularise the more than 5,000 employees who have been working on temporary basis for over two decades. However, the JAKS, a GJM affiliate and an umbrella organisation of casual workers of the GTA, not seeking to enter into any sort of confrontation, said it was hopeful of getting support from the state government as well. “We thank the GTA and its chief executive, BimalGurung, for considering our issue seriously and taking steps to address the demand that has been pending since long. At the same time, we are hopeful the state government too will work along with the GTA for effecting the regularisation,” said JAKS spokesperson Deepak Sharma today. In order to realise their demand, the casual workers resorted to an agitation in 2009 during the Left Front regime, which promised to regularise more than 3,000 employees. However, the pledge is yet to see the light of day. The Sangathan, meanwhile, believes the bureaucrats in the GTA were the ones who failed to be proactive to resolve the issue. “It is common knowledge that bureaucrats play an important role in implementing official works. It is up to them to move the concerned files and get the approval of the authorities. Sadly, this has not been done,” Sharma said ruefully. Nonetheless, he expressed optimism that the GTA principal secretary, who is presently in Kolkata working on the regularisation issue, would return with positive news. “The principal secretary will be returning to Darjeeling next Wednesday after meeting the concerned authorities at Nabanna. We will meet with him for updates on the matter,” the Sangathan spokesperson said. Besides regularisation of the casual workers, the JAKS also wants their salary to be enhanced by 20 per cent as promised by the GTA a couple of months ago. In January, the GTA passed a resolution to raise casual workers’ pay by 20 per cent till the time they are regularised. “We have received in arrears a 5 per cent enhanced salary from July 2014, the implementation period, which has definitely brought us relief given our meagre wages. However, we also want the remaining 15 per cent to be paid soon,” said Sharma. The Janmukti Asthayi Karmachari Sangathan (JAKS) has expressed satisfaction with the decision of the Gorkhaland Territorial Administration to regularise casual workers and expressed hope that the state government too would extend its cooperation.